How Do Parrots Use Their Beaks to Eat? He needs a strong beak to effectively eat. Your parrot's beak isn't the blunt instrument it may appear to be. It is a powerful and formidable weapon, but it's also capable of doing precision work. Needless to say, your parrot's beak is invaluable for eating. It's important that you help keep it healthy his whole life. Parrot beaks are extremely strong, and one of their primary tools for protecting themselves. 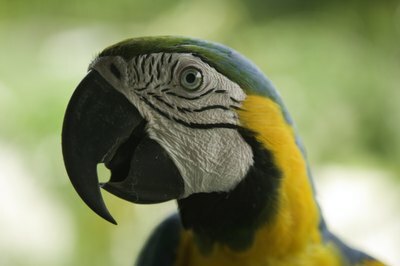 The same beak strength a parrot uses to take down would-be predators allows him to enjoy a varied diet -- instead of just eating small or soft foods, he can easily bust open nuts and seeds that have hard outer shells. Your parrot can crack a shell that you would need a nutcracker to open, and he does it without hands. His beak allows him to consume hard foods as easily as he does berries. Your parrot's beak is powerful and it's precise. Parrots use their beaks to eat a variety of foods that require something other than sheer force to consume. For example, a parrot may use his beak like a surgical scalpel to removing seeds from their casings or to peel fruit. Parrots are resourceful; at mealtime, they use their beaks to access a variety of naturally encased sources of nutrition. The beak is always growing. It is coated in a hard keratin shell that continually replenishes itself, so it's always fresh -- like your fingernails, but much stronger. Because the shell is always growing, parrots have to wear the beak down by frequent eating and chewing hard, solid foods. Otherwise the beak can become overgrown. Because their ability to eat and defend themselves is so dependent on their beaks, parrots in the wild have to be careful to keep them healthy and strong. In captivity, they may need your help. Malnutrition can lead to compromised beak health, causing it to grow soft and less effective at grinding hard foods. Meanwhile, liver disease can affect a parrot's beak health. Because issues like these can be resolved with diagnosis and proper care, it's crucial that you take your bird to see an avian veterinarian for regular checkups. Such conditions are usually preventable.